Also, the #endTB dream will continue to remain a mirage if we fail to address social influencers that increase TB risk for a large majority of our populations, severely impacting the most disadvantaged. These were some of the insights shared by Dr. Anne Fanning, who has dedicatedly worked for fighting infectious diseases especially TB, and was instrumental in bringing issues of less heard populations such as indigenous peoples to the fore. Dr. Anne Fanning was in exclusive conversation with CNS (Citizen News Service) at the 48th Union World Conference on Lung Health in Guadalajara, Mexico. 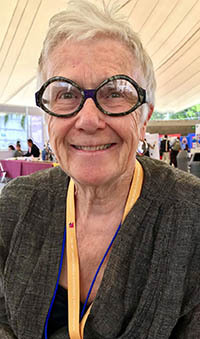 Dr. Anne Fanning has earlier served a decade on the board of the International Union Against Tuberculosis and Lung Disease (The Union), and has been its past President too. Earlier this year Dr. Anne Fanning was inducted in the Alberta Order of Excellence. She has earlier served as Director of TB Services in Alberta, medical officer at the WHO Global Tuberculosis Programme, and as an eminent physician, emeritus professor and global health leader at the University of Alberta. Her work is decorated with several honours including the Order of Canada; the Japanese Anti-Tuberculosis Association TB Global Award; the Queen Elizabeth II Diamond Jubilee Medal; the Alberta Centennial Medal; and the Canadian Medical Association’s highest honour, the Frederic Newton Gisborne Starr Award. She has also received a Lifetime Achievement Award from the Canadian Society for International Health; the May Cohen Award from the Royal College of Physicians and Surgeons Canada; and Physician of the Year Award from the Capital Regional Medical Staff Association. Anne was also named as “One of Alberta’s Physicians of the Century” by the Alberta Medical Association in 2005. "We have gone a million miles from when I started in TB. And when I started, it was ‘doctor knew best’, ‘patient did as he/she was told’ and we hoped they took their pills for 18 months, back then. We have enormously advanced in terms of having earlier diagnosis, better drugs, better systems, and better diagnostics, but we have missed out some of the core that TB taught us" said Dr. Fanning. These core lessons were taught to us by “the programmes that were in poor countries like Tanzania, Malawi, Nicaragua, among other nations, that recognized that there are a few core things that you have to do – you had to find the case with simple and relied-on diagnosis, you had to assure that the drugs were on hand and there were no stock-outs, and you supervised the treatment until cure" added Dr. Fanning. Reflecting on basic lessons that helped lay the foundation for TB control, Dr. Fanning said that “We focused on the patient – that demonstrated, that, with a systematic approach you could do it – but that was not patient centric! We have to hear from the patients - we have to acknowledge that some patients we never hear from because they cannot afford to get into the system. I hear the strengthening of the drugs and diagnostics, but I worry about forgetting the core of the patient being at the centre, and the patient deserving respect and recognition and support to get through it, and having the right to an opinion. I think those were the things - I am not sure we ever had it [ideal patient-centric TB programme]! So we had some strengths, we engaged larger communities, scientific communities, the lab communities, the civil society and all of them have learned but there is still a dispersion of knowledge and I worry about the core of it. I think at the heart of it all we have to remember that the patient, and it is probably the poor patient is the neediest and that’s where our focus should be." Yes, we do have faith we can do it, but we also cannot deny that we are not doing enough to bring TB decline rates on track so that TB gets eliminated from the planet by 2030. "At current trajectory, TB will be beaten in 200 years' time" said UK parliamentarian Nick Herbert at a Symposium organized by the World Health Organization (WHO) before the 48th Union World Conference on Lung Health opened in Guadalajara, Mexico. Dr. Fanning advises "with all these players involved and with all these technologies, labs and new drugs, the key thing is to DO IT RIGHT whether it is the first treatment or the drug resistant treatment. Every treatment has to be patient-focussed, accepted by the patient, and accessible to all. And I worry that we get distracted." "I think the radical piece is contained within those SDGs. I think SDGs are extraordinary – they are a grassroots movement and they have been 'bought into by the world' – I think we have to make the world aware that it has bought into it – because I am not sure people in my community know that. I think we have to pay a lot of attention to those underlying social determinants of health that we have ignored – at our peril – because – the drugs are not enough! I think you can shut down TB if it is simple to teat, may be if it is drug resistant, but you are never going to wipe it out without addressing the housing, poverty, crowding and vulnerability of people. So, I will return to The Union’s core values which are ‘Health solutions for the poor’ - we have to remind ourselves of that again and again. The burden of disease for me and my peer group growing up in Canada is almost gone, and it is gone because we have had a healthy existence and we have to make that available for everybody” emphasized Dr. Anne Fanning. The urgency to act is now. There is no excuse for inaction while we wait for a perfect vaccine to hammer the final nail in the coffin and end infectious diseases. "Infectious diseases have laid up an opportunity to actually eradicate with, if not vaccine, then simple diagnosis and fairly simple, straightforward treatment. It is hard to think of a non-communicable disease that fits into that category and has simple tools, simple systems to find, detect and treat. Now, it is beginning to be done with diabetes, hypertension, and smoke cessation, which is critical. We need to find those simple population-based interventions and go for them as those are examples of health solutions for the poor” said Dr. Anne Fanning. Dr. Fanning stressed "We cannot ignore the need to protect healthcare workers – they are among the most valuable resource we have – the nurses, outreach people, among others - and we have ignored that responsibility at our peril. The cost of re-fitting treatment centres with air flow, ultra-violet and giving every healthcare worker a N95 mask which they can discard every hour, might be huge” but we cannot ignore this issue anymore. Cutting the transmission chain of infection is critical if we are to end TB. “I am really proud of The Union for its acknowledgement of the importance of health solutions for the poor. It is very exciting that TB system-approach did not forget the patients and did enable expansion substantially of the programme, and always being able to evaluate at the end of every year. It is the only disease apart from HIV probably where I know you can get data. That makes me really proud” rightly said Dr. Anne Fanning. "What I remember most was an indigenous patient I had met few years ago, after I had finished seeing patients (retired) who had been born in an indigenous community and had from the age of 4 onwards been in a residential school – and had been badly treated, traumatized and infected with TB. As for many of those indigenous kids, lost both his sisters to stories that sound like they could have been TB, and was severely physically damaged by a disease. His whole life is so severely affected – we just cannot let that happen anymore, anywhere, ANYWHERE!” said Dr Anne Fanning. Walking back from this insightful listening session with Dr. Anne Fanning, one realization was stark clear: either we will fail on all SDGs or deliver reasonably well on all of them. If we end TB it will also imply that we have made radical progress on housing, ending poverty, ending hunger, reducing inequity, furthering urban sustainable models of development, among others – there is no other way around reaching the #endTB bull’s eye.